LITTLE ITALY — It's not exactly ghoulish, but Kevin Skarbek said a pumpkin left next to the site where he is building a home on historic Bishop Street is "rude and classless." Many neighbors have referred to Skarbek's plan for his home as a "McMansion." He plans to build a home much larger than the row home that had been there, and the home will eventually interrupt a string of front yards that are all set back from the street. But he criticized how far his critics have taken the fight. Later Tuesday, Skarbek's next-door neighbor, Paul Fitzpatrick, said his wife decorated the pumpkin, which actually sits on his yard to the north of a fence surrounding Skarbek's lot while the new home is being built. "I meant it as a good gesture," Carrie Fitzpatrick said. "He likes big houses, so I thought he'd like a big pumpkin. 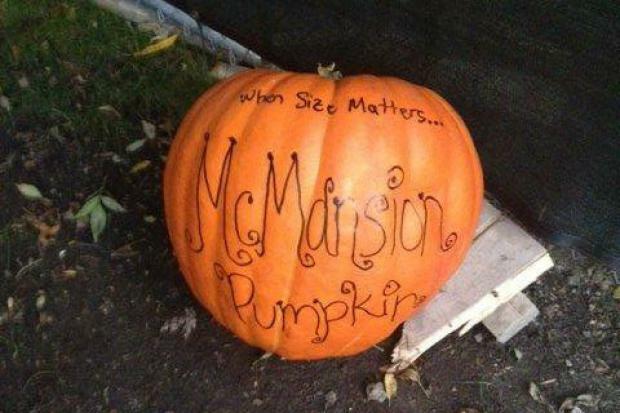 I spent a lot of money on that pumpkin, and if it backfired, I'll feel really stupid." The Fitzpatricks are parties to a lawsuit, filed after Skarbek razed the old home last month. The next hearing for the case is set for 9:30 a.m. Tuesday.